Page : 2017-2018 Kresge KIP:D Grant Projects Announced! 2017-2018 Kresge KIP:D Grant Projects Announced! livingLAB led planning processes that resulted in 2 neighborhood organizations receiving additional funds as announced by The Kresge Foundation today. $2 million will fund 17 new projects aimed at revitalizing Detroit neighborhoods in the third and final round of the foundation’s $5 million Kresge Innovative Projects: Detroit (KIP:D) initiative launched three years ago. Walk Woodbridge and Barham Greenway + Farmway were included in the pool of 17 recipients. The Woodbridge Neighborhood Development Corporation will continue progress on implementing their plan to increase pedestrian and bicyclist safety, mobility, and connectivity within the Woodbridge neighborhood and with the broader surrounding neighborhoods. Strategies investigated in the planning process included rezoning to encourage mixed-use development, development of a communication/education plan, recreation and health programs, protected bike lanes, traffic calming improvements such as mini traffic circles, curb extensions and painted curbs, priority corridor sidewalk replacement, coordinated alley improvements, and increasing the organizational capacity of the CDC and WNDC. The neighborhood was engaged throughout the process with opportunities paired with existing neighborhood events to allow for input on a personal level and across a broader cross-section of the community. Attendance was encouraged via email, social media, phone calls, and fliers. 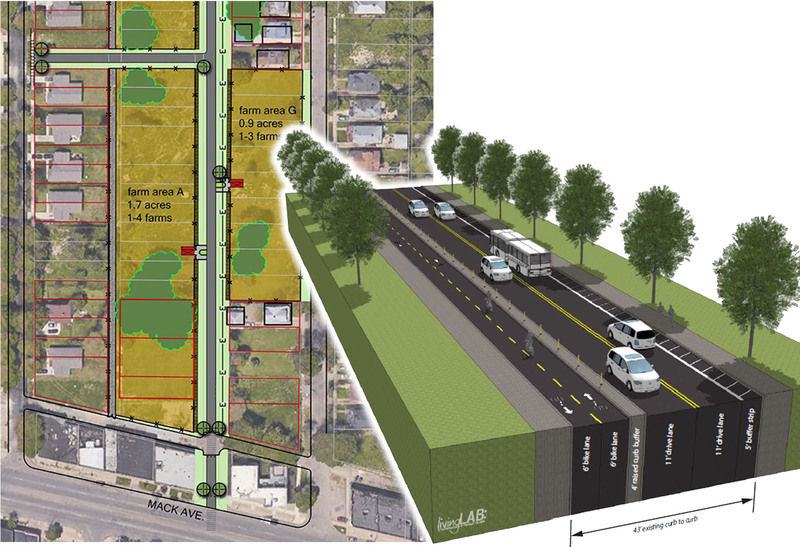 U-SNAP-BAC will transform a largely vacant, half-mile stretch of Barham Street into an innovative public greenway and farmway in the Morningside neighborhood. The goal of the project is to minimize initial capital investment requirements for urban farmers such as land acquisition, environmental assessments and clean-up, fencing, access to water, storage, and equipment. By activating this largely-vacant land, farmers will gain access to land on a rent-to-own basis and have immediate impacts on illegal dumping, failing infrastructure, and vacancy common in the area. Improvements in safety and aesthetics will pave the way for green venture business establishment. U-SNAP-BAC will facilitate the process, project, and configuration for the land along Barham Street to function as ‘condo-ized’ plots and farms. Additional benefits to the neighborhood include employment opportunities and local job creation, engagement through programs and activities along the farmway, gleaning days for neighbors to harvest fresh foods, as well as community garden space for residents to farm small plots and learn about green venture business and food production. Next - MoGo: Detroit Bike Share Launched!